LB6100 Calibration Notes: From the Cinema (User) picture setting mode you'll be able to choose between the 2 point and 20 point white balance settings. These can be found and activated in the Advanced Settings menu. The C.M.S. settings do not need any adjustment and are just fine if left alone. Gamma and Grayscale calibrated extremely well on the LB6300 as did the overall calibration to D6500K. Dialing in the right calibration settings is key to getting the best picture out of the LB6300 from LG. 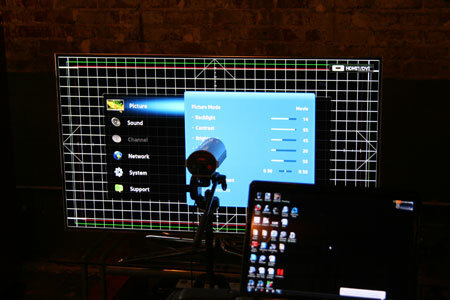 A television in the process of being calibrated before we begin our review.